Rocker Embroidered Skinny Jeans with Rips. Make a deadly statement in these mens embroidered skinny jeans featuring embroidered logo text and boho skulls along front and back pockets. Light blue jeans are made in a faded, antique wash with wrinkling and distressed rips down the thighs and knees. 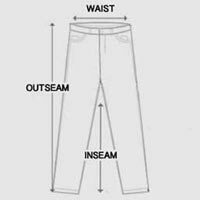 Skinny-fit design includes belt loops, button-up fly, and five-pocket design. Embroidered logo text and skulls are detailed with patches of black, faux snakeskin and copper circle studs. Back pockets are stitched partially closed by large embroidery covering the opening. The rocker motif on these embroidered skinny jeans for men is what’ll really set your embroidered jeans apart from everyone else.